To view our current inventory of artificial and bubble horizions, click here! This Unusual Relic Has Been Sold. Fully Adjustable and Newly Rebuilt! This is one of the very rare C. Plath Bubble Horizons that has a fully adjustable bubble, and a rheostat for adjusting the brightness of the internal lighting system. Regardless of what you read elsewhere on the internet, the trade name of this unit was "DRAGONFLY" , and the design dates back to WW II, when these devices were successfully used on all types of surface ships and submarines. After cessation of hostilities, Plath did not get back into the sextant business until about 1954, and this version was reintroduced to the Commercial Marine Market in 1957. During the period 1950-1960, the German Navy requested this design be used in the "Libellenhorizont" and from 1970 through 1980, similar devices were issued to U.S. Submarines to allow for backup celestial naviagation under all conditions. 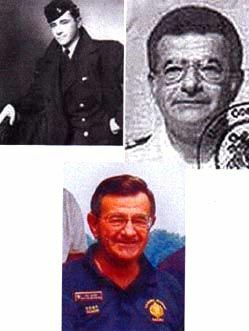 They also were much in demand by the world's merchant mariners. Because of the expensive design, not many of the Dragonfly bubbles were made after WW II, before they were discontinued and replaced by a more simplified version that eliminated the adjustable bubble, and finally the adjustable lighting was discontinued. Plath received many comments from users of these devices who preferred the fully adjustable versions and felt the new one was a step backwards. Over the years, the new version Plath bubbles have been well accepted by seagoing users, and the demand for them continues even as they become more difficult to find. Clean and polish all screws. Clean all other parts except the bubble sub-assembly which is in good workable condition. It was partially cleaned. The disassembly of this instrument indicates it is of an early design from WW II despite the higher serial number. CONDITION: Used. Rebuilt as above. The bubble chamber was not leaking and had no evidence of deteriorartion and was left "as is" except for cleaning of the visable exterior. On the exterior of the unit, it was decided that the instrument should not be repainted. Consequently, it shows the marks of age, wear and previous touchup. The dimmer adjustment knob is new. The slip-on green filter for the objective lens is missing. A power extension cord is included with a spare bulb. In the photograph below, it is shown alongside the last bubble horizon design made by C. Plath which has an internal power supply. Like all Plath bubbles, except for the one being offered, the size of the bubble is not adjustable. On July 3, 2008, Ken Gebhart of Celestaire wrote us that the last version was discontinued around 2001, and sold new for $1,700.00. 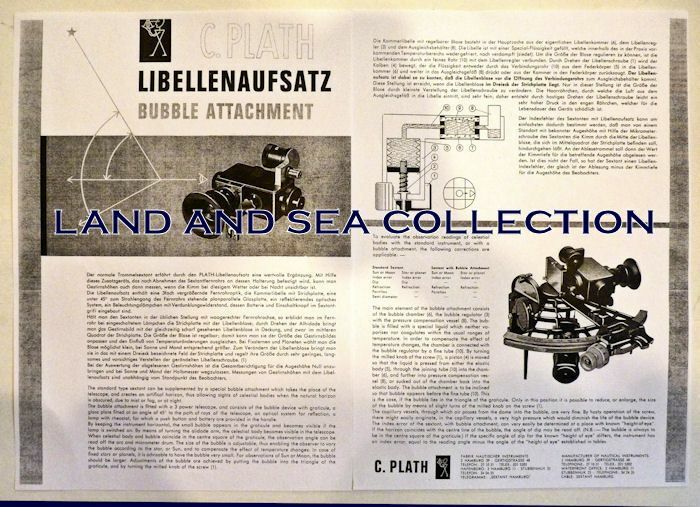 DIRECTIONS & INSTRUCTION SHEETS: A Plath sheet of instructions in German and English comes with the device. There also will be a diagram of the internals and a diagram of the geometry of the optical system. The device is simple to use and provides an artificial horizon using a circular illuminated bubble as a substitute for a horizon reference. The bubble is centered at the midpoint of the viewing area and the celestial body is brought into coincidence with the bubble's center. Intensity of the internal light is adjusted by a small knob on the front. Bubble size is adjusted, by the larger rotary dial on the base of the cylinder on the left. A large bubble is preferred for sun and moon sights, and a smaller bubble for stars and planets. The ocular lens is adjustable. Land An Sea Collection's Supplemental Instructions are also included. CONDITION: Used. Recently rebuilt. Power extension cord and spare bulb included. Sun Shooter (So Ballerspiele) Logo over C. Plath, over Hamburg, Werk-Nr. 1613, over West Germany. SUGGESTED USE: The bubble horizon has a 3 power optical system and a smaller than normal field of view. The internal dampening mechanism of the bubble is greater than will be found on less costly alternatives, but requires some practice in getting used to. The Plath, fully adjustable Bubble Horizon is far superior to all other artificial horizons, and the devices that can only be used for objects with altitudes of less than 60 degrees, and cannot be used for twilight sights. This makes it ideally suited for land based training applications, for land navigation and for use at sea from ships large enough to be a stable platform. Interestingly, in the 1970-80's, this device, in the form being sold, was issued to U.S. submarines for back-up celestial navigation. Ref. Dutton's Seamanship & Navigation, 12th Edition, Article 2206, page 385. In 1962 C.Plath was acquired by Litton Industries, a large American concern.The C.Plath North American Division was set up in 1978 in College Park near Washington. 1996 saw the introduction of the world's first fiber-optic solid-state gyrocompass by C.Plath. The first ever gyrocompass with no moving parts. Sperry Marine was formed in 1997 with the combination of C.Plath, Decca Marine and Sperry Marine with more organizational changes yet to come. After 163 years, C.Plath changes its name to Sperry Marine in May 2000. In 2001 Sperry Marine becomes part of the Northrop Grumman Corporation. In the 1990's Plath came out with a series of new sextant designs with overlapping designs and confusing names. Shortly thereafter, C. Plath quit producing sextants. The parent company has completely liquidated everything including machinery, equipment and spare parts. OUR UNCONDITIONAL NO NONSENSE GUARANTEE: If not completely satisfied with your purchase it may be returned, if without damage, within fourteen (14) days of receipt in its original packaging. Return items must be insured for their full value. Only a prior email authorization by us for the return is required. Shipping charges are included in this offer within the continental United States if the error is due to our fault . Only once before have we offerred a C. Plath Bubble Horizon of the Dragonfly adjustable design and only four other times have we sold brand new versions of their less sophisticated models. It took us a long time to find this one, so don't count on us finding another.